The authors of this book, James Gwartney, Richard Stroup,Dwight Lee, Tawni Ferrarini, and Joseph Calhoun, are all life-long economic educators who know how to use the tools of economics to illuminate why both individuals and nations prosper and how they can be more successful. The book is concise, thoughtfully orga­nized, and reader-friendly. Whether the economy is growing, stagnating, or declining,there are basic economic principles that are always operating, such as gains from trade, opportunity cost, ability of prices to communicate information, the importance of diversification, the power of incentives and how they create fundamental differences in market and political decisions. 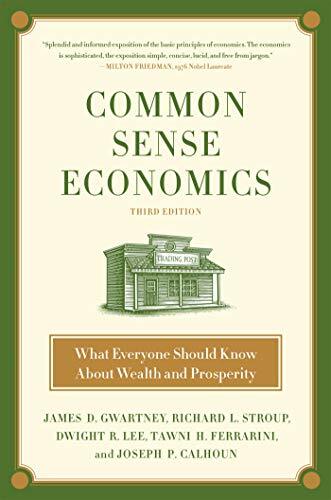 Common Sense Economics is written to provide comprehensive and understandable explanations of key principles that will help everyone make better personal and policy choices. Already a classic, the third edition is fully updated and more relevant than ever for a world starved for sound economics.